1. She has discovered other children. She makes a soft "oooohhhhh" sound whenever she sees another child and gets really excited. 2. She loves to clap and bang. She started by clapping your hands for you, then moved on to banging toys, and now if she's in a very good mood she will clap her own hands. 3. While she is loving solids, they are not loving her. If we don't give her plenty of prunes and apple juice we run into serious problems. Not fun. 4. She eats her shirt or her sleep sack when she is tired. This makes her sleep sack kind of gross. 5. 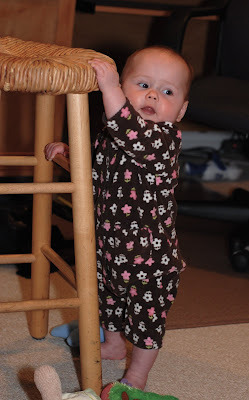 She is learning to stand. She can only do it for about 30 seconds before she falls down, but she is very proud of herself. 6. She rashes up at the slightest touch. You kiss her cheek and instantly it is red. She scratches her head and has a HUGE red line. Luckily the red marks disappear as quickly as they came. 7. She loves her mesh baby feeder. I've tried pears and frozen bananas--it keeps her occupied for a good 20 minutes. Very handy when I'm trying to make dinner. Those are 7 great things! Where did 7 months go? she is getting so big...could not be any cuter!